Wednesdays are the new Tuesdays when it comes to cottage manufacturer interviews. So today we will learn what makes ZPacks such a fine cottage, how often Joe is out hiking, what is his next long distance trail project and what kind of new SUL products we can expect from ZPacks in the near future. Grab a cup of tea & biscuits and enjoy. Joe, please briefly introduce yourself and tell us who you are. Since when are you backpacking, and how did you start? I started backpacking when I was in high school in the 90's. I first heard about the Appalachian Trail back then and knew it was something I wanted to do. That's when I bought my first set of backpacking gear and started doing training hikes. I finally thru-hiked the Appalachian Trail after graduating college in 2004. How often are you out backpacking nowadays? We typically try to plan a hike at least every month or so- usually 3 day weekend hikes or week long trips. Living in Florida we do most of our trips in the fall, winter, and spring. Either on the Florida Trail or up north on the AT in Georgia or North Carolina. You're a triple crowner, having finished all three long distance trails in the United States. Which one did you like best? I liked the Pacific Crest Trail the best for sure. The trail is well maintained, the weather in that part of the country is great in the summer, and it has a really good balance between a wilderness experience and a close knit trail community. It is the best of all worlds you could say. The Appalachian Trail by comparison is a bit crowded and not as much wilderness. It can be a pretty wet! It does have a good trail community and good trail towns. The Continental Divide Trail is the opposite end of the spectrum- very wild, sparsly populated. It is challenging somtimes to navigate, and there are hazards like snow storms and very long distances between water some times. The scenery in the Rocky Mountains is epic, but the PCT is just as good without as much trouble. Any other long-distance trails you're having an eye on, or are you nowadays more of a "weekend hiker"? My wife and I plan to do Te Araroa, the New Zealand Trail in 2013. It is a roughly 3,000 km trail the length of New Zealand. We would also like to do the Pacific Crest Trail again some day. We aren't sure what to do about the work shop while we are away. Now that we have employees it is not as easy as just closing shop for five months. I reckon we can put you firmly in the UL backpacker category, right? What is your typical baseweight? I typically carry around 5 to 6 lbs (2.5 kg) baseweight. I might leave a few things behind on a weekend trip if the weather is nice, but for the most part I carry the same gear if it is 3 days or 5 months. Please tell us where the name "ZPacks" came from, and what it stands for. I wanted a name that was short and easy to remember. The web address ZPacks.com was available so I grabbed it! Other than that it doesn't have any great significance. 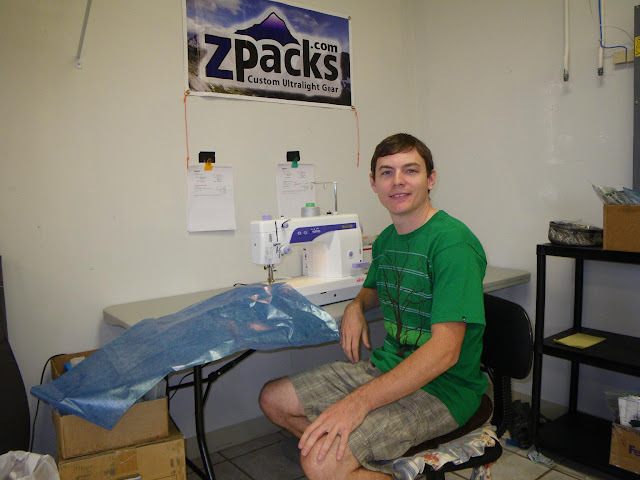 ZPacks makes innovative lightweight gear, which started off as a side-business only in the beginning, but nowadays has grown into a proper cottage, and you even have a few employees. Can you tell us how the idea to start the company emerged and how you see its future? What makes ZPacks different from other cottages? We do alot of customized products and modifications. We still build most products one at a time and we are usually able to accomodate requests, for example changes in size, or different features. I like to think the customer service experience is very good. The ZPacks cuben Blast backpack and the Hexamid shelter are proper UL products, aimed at people who want to go really light. Can you tell us a bit how you went about the design process of these two pieces, and where the inspiration came from? Most of the products start as something I want to use myself. I designed the Blast backpacks originally for my wife and I to use on our Pacific Crest Trail hike. The original Hexamid tent was created right before I did my Continental Divide Trail thru-hike and it was tested on that trip. Often times once I start selling a product customers suggest improvements and they get even better. I guess you could say my main drive is to create products that solve a problem like "shelter" or "carrying gear" in the lightest, most efficient way that I can. You just released the "Exo" External Frame backpack, how did this design come about? The Exo is made from stronger material, and it has an ultralight frame to help carry a load more comfortably. I know that not everyone has their gear list as stripped down as mine and I wanted to make a backpack to help bridge the gap between traditional heavier gear and ultralight frameless backpacks. The Exo can carry more weight comfortably, but I still tried to make it as lightweight as I could, around 335g. Joe, we love to be let in on the work-in-progress stuff! Can you let us know what kind of new products you're working on at the moment? We just started doing ultralight down sleeping bags last month. We are exited about those since we now make all of the big three gear items: backpacks, tents, and sleeping bags. We keep adding new things as time allows, you'll have to check the website for the latest. Yes actually! We just received our first production batch of a new waterproof breathable cuben fiber material at the beginning of October. It is the lightest wpb fabric available that I know of, and we have a jacket made from it on the site. A bivy should be coming soon pending testing. 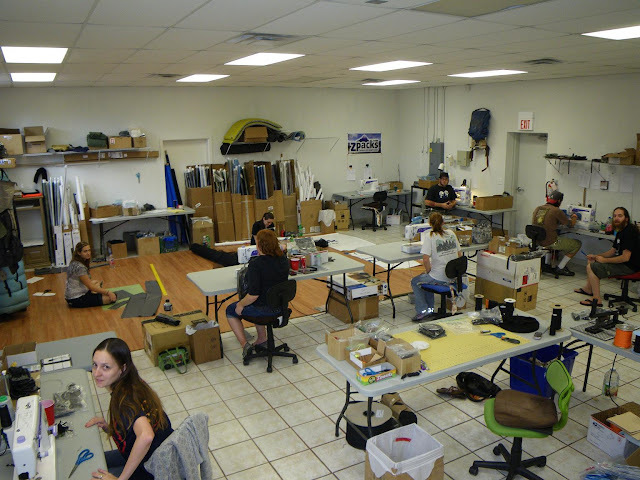 How works the R&D at ZPacks, do you have a need yourself that you try to fix, or do some of your clients inspire you for new products and ask you for solutions to their problems? It is a little of both. A lot of the items are things I personally want, but I also do custom projects on request. If enough people ask for the same thing, and give good feedback, it will end up on the website. Our customers come from pretty much everywhere in the world. The majority are in the US, but Australia and Japan are the next biggest destinations followed by Canada and European countries. Are you in touch with other cottage manufacturers in the USA, Europe, Japan and other places? We have met a handful of other cottage manufactures in the USA at various hiking conventions. I don't have any contacts outside the US. My big three are a Exo backpack (335 g), one of our down sleeping bags (476 g), and a Hexamid Solo Tent (250 g). I always carry a nylon wind breaker jacket, and a fleece hat. Other than that I just add warmer clothing and rain gear as necessary. I think one of our new waterproof breathable cuben fiber jackets will be a new favorite. When and where was your last backpacking trip, and what was your baseweight? My last trip was to a place called Eagle Creek, near Cascade Locks, Oregon. The route we took passed through one of the more scenic sections of the Pacific Crest Trail that I have been to before. It was just an overnight loop. I probably had around 4 lbs (1.8 kg) or less, just the essentials. I carried the items I mentioned above, a neoair sleeping pad, a few small items like a headlamp, plus food and water. The weather will finally be cool enough to start getting out on the Florida trail. I don't have anything big planned but I like to do something outside every weekend if I can, sometimes canoeing, or biking, or surfing if not hiking. I think ultralight backpacking is probably growing every year. I don't think many people that try ultralight gear go back, so the tide should keep shifting to lighter gear. I don't know if the real ultralight stuff will ever be mass market, ultralight gear isn't as easy to mass produce, and it requires informed customers to use it correctly. Joe, thank you for taking the time to answer my questions =) Is there something you would like to add? Enjoyed this cottage interview? Read the other ones and Like it on Facebook!